The white-cased is the Voere caseless round. Propellant is the case. War wolf great work! My boys and I have loved your work. We are big 5.7 fans. Keep up the good work bro. Which ammo is good for in door range? Santagata wrote: Which ammo is good for in door range? The kind you can find/afford the most of. One of the reasons the FsN is hard to sight in is that the different ammo has different points of impact (POI) on the target. My recommendation is to use whatever ammo you can get a hold of for practice, just work on your grouping. Then, once that is consistent, sight your gun using the ammo you will carry with. If you won't be using the gun for defensive carry (i.e. range gun only) then sight for the ammo you would normally use. So beside the green paint, is there any real difference between the old white box SS195LF and current SS198LF? As I recall the whit box ammo ran about 2100 FPS out of my five seven. Surfgun wrote: So beside the green paint, is there any real difference between the old white box SS195LF and current SS198LF? As I recall the whit box ammo ran about 2100 FPS out of my five seven. SS198 is loaded a bit hotter than SS195. I want to say about 50-100FPS faster out of the 5.7. White box SS195LF has been in the 1950-2050 range from what I recall. I have a box to test that. SS198LF is around 2100-high 21xx fps. Current list from FNH Ammunition. LOL Half of those have not been imported in almost 5+ years. :ponder: So.. It is my understanding that the ss195 is 2600 fps out of the PS90 and so the ss198 should run about 2800 fps out of the PS90?? The T6b runs at 3095 fps out of the PS90. Am I correct with these numbers? Also.... What is the Foot pounds of the T6b compared to the ss198. Thanks!! M1P90 wrote: :ponder: So.. It is my understanding that the ss195 is 2600 fps out of the PS90 and so the ss198 should run about 2800 fps out of the PS90?? The T6b runs at 3095 fps out of the PS90. Am I correct with these numbers? All those velocities are subject to change whether FN's or ours. FNH is always using different powders and before I started importing powder during the lack of supplies I had to use powders that would cost me 100fps. Not much but still not optimal. 319 for the current T6B from a FsN 562 for the PS90. 2800 fps is a bit high, when I tested 198 from a PS90 I got 2710 average. BUT based on the 2800 it would be about 460 foot pounds. If you have 2 of the 3 values most free on line ballistic programs can supply the third value. I like Point Blank for fast stuff. I use an older version, the new and improved one is no longer fast and easy. :thumb: Thanks! Now I'm really liking the T6B ammo! Last edited by M1P90 on 27 Jun 2015, 04:13, edited 1 time in total. What type of velocity are you getting with the SS195 out of the PS90? I'm curious if SS198 is worth the $0.10-$0.15 price increase over the SS195 in the PS90. "5.7 x 28 P90 related items. 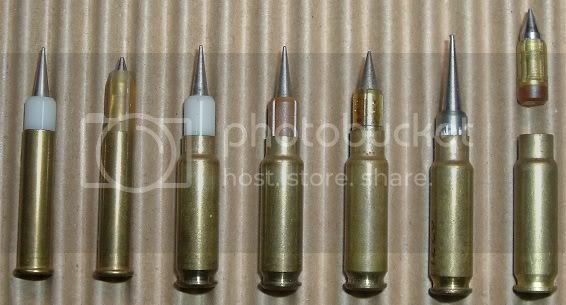 There are 3 case types here: .22 Magnum (2nd round is a triplex loading), 5.7 x 27(short neck) and normal 5.7 x 28 (end round has duplex projectile." Not sure what the material is, or whether any were ever fired, but certainly a cool bit of history.